We are delighted to inform you that SunnyCha Malaysia, specializes in tea, located at Sunway Pyramid. 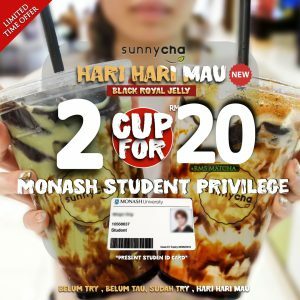 They are giving your students a special privilege when they visit SunnyCha. Students who present id cards are entitled to20% discount off their total bill on top of that we are also giving a special promo on our new product. Their menu and promo visual are attached below for your reference. Go, enjoy and wish you a great day ahead!